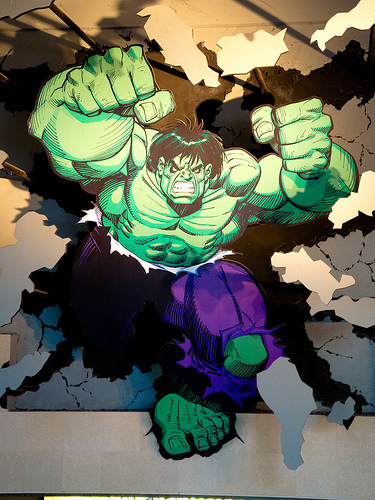 What does it take to create super-strong ad copy? Nothing except the correct approach. Here, we’ll share five tried-and-true ideas for writing ad copy that has a competitive edge. Once you learn these methods, you should expect your ad copy to be positioned for exceptional performance, which is a claim that we will set out to prove immediately. Showcase your value propositions so the reader knows exactly how your product’s coolest features will benefit them, as opposed to simply stating the product’s cool feature. For example, people don’t care that your product — let’s say it’s a memory card — has large storage capacity. They do care that it can hold more than 1,000 of their favorite pictures. Applying this thinking to the ad copy for your memory card; you wouldn’t want to simply state your product’s cool feature. Instead, emphasize how this benefits the user. Use this technique to your advantage and explicitly show people how your product will improve their lives. A Kissmetrics study found that the number-one reason for cart abandonment is when a shopper goes to checkout and sees there is an unexpected charge for shipping. Offering free shipping at certain thresholds can also increase consumer spend. A Pulse of the Online Shopper global study of 19,000-plus online consumers found that 58 percent of U.S. shoppers have added items to their cart just to qualify for free shipping. 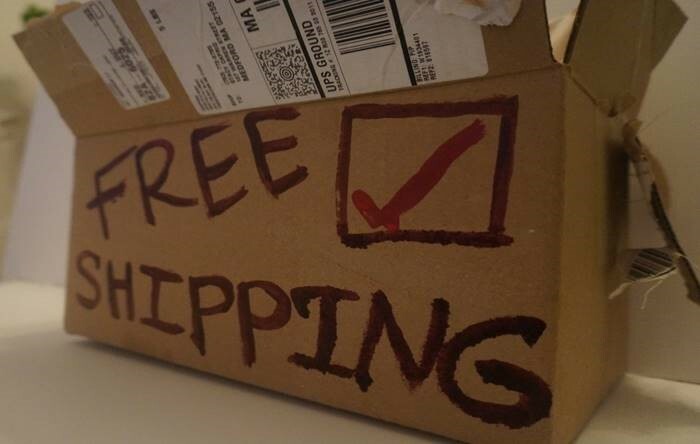 Offering free shipping at specific spending thresholds can keep consumers happy. This also helps businesses by raising the average order value. Higher average order values offer an extra incentive for those unsure whether free shipping would be profitable for their specific business. A spend threshold can be whatever makes sense profit-wise for your business, whether that be Amazon’s $35 free shipping on qualified orders, or another number that makes sense for you. Emphasizing that you offer free shipping — as well as same-day shipping — in ads can also have a positive effect on consumer behavior and profit. Below is data from two Exclusive Concepts Inc. Google AdWords pay-per-click ad campaigns. The two campaigns are identical and include the exact same ad groups. The only difference between the campaigns is that one offers free same-day shipping on both the ad copy and site while the other does not on either. Campaign B, the one that offers free same-day shipping, has 447 percent higher conversion rate, a 442 percent lower cost per conversion, and 436 percent higher ROI (as measured by conversion value/cost) then the campaign that does not offer free same-day shipping. This comparison is a compelling example of how shipping can influence buyer behavior to the point of huge differences in profit. Investing a little money in offering free and/or fast shipping has the potential to decrease the amount you spend on a new customer as well as increase how many people buy from you enough that it will often pay for itself many times over. Use all the ad extensions you can! The available extensions for Google AdWords text ads are Sitelinks, location, call, app, review, and callout, and I recommend using all of them whenever possible. All extensions appear below the ad text causing the ad to take up more real estate on Google when your ad is showing in one of the top positions. Cost per click is often higher in the top positions, so your ads may end up spending more when these do show, however they cost nothing to add to a campaign and nothing extra is charged when a user clicks on them. 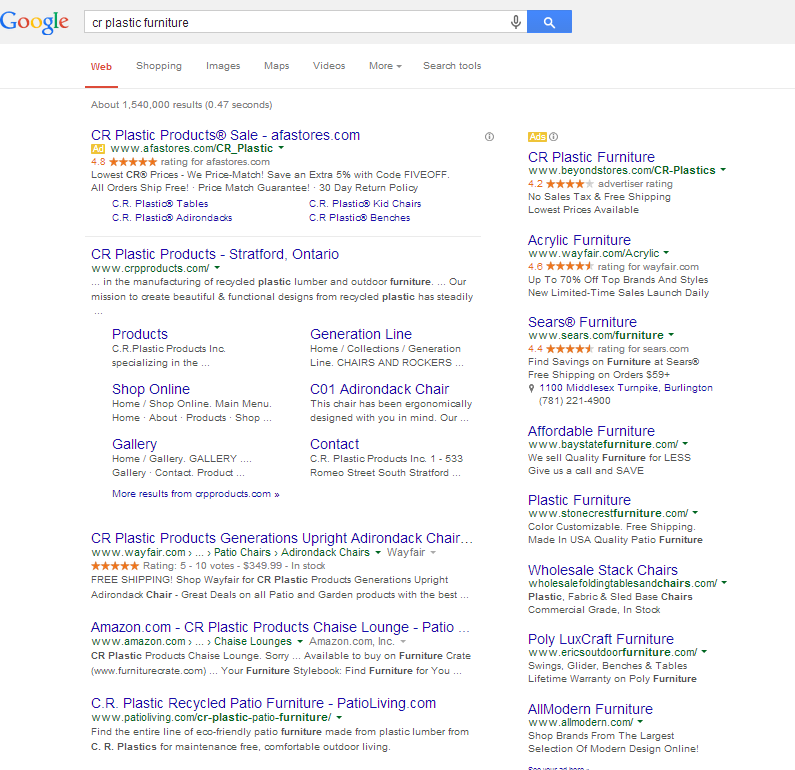 The following example for a branded search for ‘cr plastic furniture’ illustrates the expansive power of using ad extensions, as well as illustrating the eye catching using a registered trademark symbol can have. Creating all the possible ad extensions for all your campaigns will give your ads a chance to be shown with more information for shoppers, with the added benefit of taking up more real estate on the page. This extra information and prominent page position will help shoppers see and know more about you, leading to extra (and higher-converting clicks). Do a Google search for the keyword you’re bidding on, and if everyone’s ads look the same, write something different and eye-catching. If your ad has the exact same headline as all your competitor’s ads, how will people know you are different and even more awesome than your competitors? They won’t, and there is less of a chance they will even click on your ad. 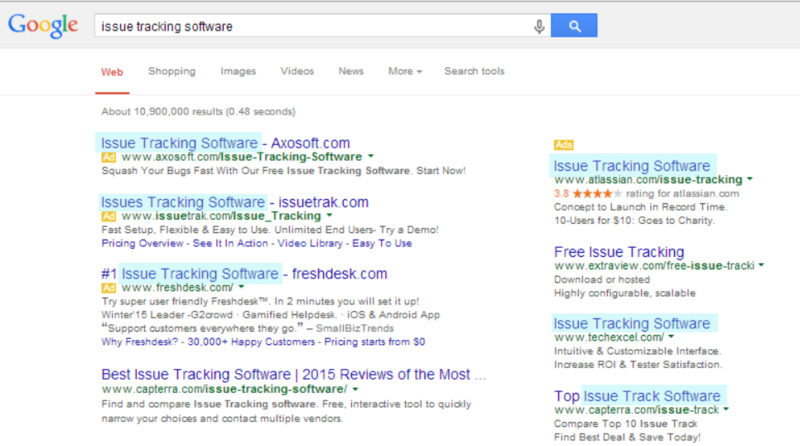 Below is an example of what identical ads look like; when someone types in the keyword “issue tracking software,” the majority of ads have the same exact headline. Shoppers reading these ads will have a hard time determining which company is clearly the best and which they should click on to learn more about. The easiest way to avoid creating an ad that mirrors everyone else’s is to do a quick Google search for the keyword you are advertising on before writing the ad. Your ad should be different than the rest and present your business as the clear choice. Make your ad the special snowflake everyone wants to click on and you will already be one step ahead of the competition. Are you selling a product that a bunch of other people are also selling? With the exact same name? At the exact same price? With the exact same features? Every product is exactly like yours, and they all have the same features-du-jour as your product. Even when your product’s main value propositions are identical to many others, you can still separate yourself from the competition by being the only one to mention them. 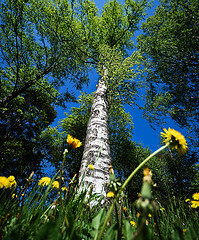 Mentioning the obvious can be profitable in certain circumstances. If you’re the only who points it out and, if what you point out is actually valuable to someone, they will be more likely to end up buying the product from you – because if no one else mentions it, they can’t really be sure the other products have this benefit, even if all the products are effectively identical. Here is some data comparing two ads for identical product; one emphasizes some seemingly obvious value propositions, while the other simply states the product brand name. Ad A emphasizes a seemingly obvious benefit, that the product is ‘Eco-Friendly w/Non-Toxic Batteries’ while Ad B does not list any of the product’s obvious or non-obvious benefits, only stating the product’s brand name and the store’s return policy. This is a product where there are many stores selling this exact product including brand name, features, and price. Both ads received hundreds of clicks, however Ad B (which failed to showcase obvious product benefits) was paused after only 1 conversion, due to a $107.83 higher cost per converted click than Ad A. Emphasizing the eco-friendly, non-toxic nature of this product correlates with a 345 percent higher conversion rate and a 335 percent lower cost per acquisition; this illustrates the potential benefits of emphasizing seemingly obvious value propositions in your ad copy. However, make sure to test and figure out what works best in your particular situation. Try some of these tips in your next campaign or ad copy refresh, and if you keep testing and modifying your ad copy, you should be able to improve upon the metrics that are important to you! Disclaimer: There are many counterexamples to these points both in my own and others’ experience. 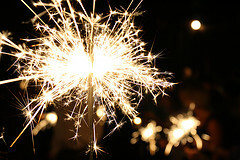 Please test and experiment with your own ads to determine what works the best for your ads. Next: Are Your Google Shopping Campaigns Optimized for Mobile?